Have any of you ever been to Gleview, Ohio? No? Let me tell you something... you're gonna want to go there. It's sunny, the people are friendly and don't even get me started on all of the activities. SO MANY ACTIVITIES! And guess what else? There's a Costco. Yep, a geniune Costco! I love Costco and coincidentally so does the Store Manager, Evan. Glenview is damn near perfect, well, it is until Costco's trusty night watchman ends up brutally murdered. Evan doesn't take kindly to murderers killing off his staff and defiling his store, so he does what any rational human being would do in this situation--he forms a neighborhood watch. 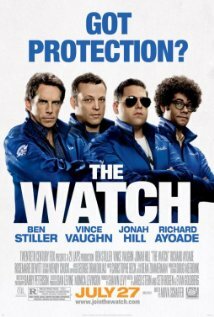 The watch consisting of Evan, Bob, Franklin and Jamarcus make it their mission solve Antonio's murder. But soon several more of Glenview's trusty residents go missing and all evidence points to aliens as the culprit. With these four eclectic suburbanites as Glenview's only remaining hope, is everyone doomed to succumb to the pending invasion? The aliens obviously have to have a weakness, right? So what do you think said weakness is? The answer is quite obvious here, folks. It's their dicks. I mean, seriously? How does an alien race survive if they're all male? Where did they even come from? How do you even procreate without all the necessary female genitalia!? I just... I don't even know what's going on right now. If you're saying "Whhaaaaaat???" right now--- exactly. And the utter ridiculousness isn't the only thing that had me smacking my head on the table. They dangle this tantalizing science fictiony "we are already among you, living as you" carrot in front of you and THEY TOOK IT NOWHERE! Yeah. Basically all of the potentially decent sci-fi stuff was a total red herring. GAH! Here's an idea. Let ME remake the movie. I'm being serious! And look movie producer guys, I'll make this easy for you. We don't have to recast any of it. That's right, we'll keep all the same actors. Just let me put those super exposive ray gun thingys to better use and bring the tone down to the likes of The Faculty or Invasion of the Body Snatchers. Now we've got ourselves a real movie! What do you say? You better act soon! My services are running at a discount (which I attribute solely to the holiday spirit). Have we got a deal? The Watch, as a sci-fi film, is just what you'd expect: unremarkable. As a comedy it's sparse and spotty, relying more on the street cred of the comedic actors in it than on the actual comedy itself. There are, however far and few between, funny moments thanks mostly in part to Richard Ayoade and Will Forte. I have to say, The Watch is a rental at most and best viewed while otherwise distracted by delicious sugar plumbs (are those things even real?) or preferably inhebriated off your perpetually drunk uncle's fabulously strong eggnog. I am so sorry that you actually watched that hot mess of a movie. That said, I had no idea there was a sci-fi element to the movie. Interesting. Still not watching it of course but yeah, that is interesting. Great review!! It was more of, like, a half-assed sci-fi attempt. I really think had they stuck with that route it would've made the movie much more tolerable. Oh well. You win some, you lose some I guess! There's aliens in this movie?! Its too bad it sucked and I *heart* Vince Vaughn. I've yet to see him in a flick I didn't enjoy. This is my first time hearing about The Watch. Thanks for the review! Yep. Aliens. It wasn't quite what I thought it would be but luckily my expectations were sort of low for this one. I'd definitely take a pass if I were you! I didn't even realise this was sci-fi! I think I'll pass. I think they weren't sure if it was supposed to be a sci-fi or not. They made the attempt (sort of) and failed miserably, at any rate! Ugh Vince Vaughan is one of those actors I hate with a fiery burning passion! Bargain box for this one!